Sony's PlayStation 4 is one of the world's most popular gaming consoles, with well over 1,500 titles available across multiple genres. Since its release in late 2013, PS4 has continued to be a top seller due in part to this wide array of games along with the fact that it also serves as full-fledged home media center. The PS4 can be enhanced even further with PlayStation VR, a virtual reality system that integrates with the main console and allows you to become truly immersed in a game from right within your living room. 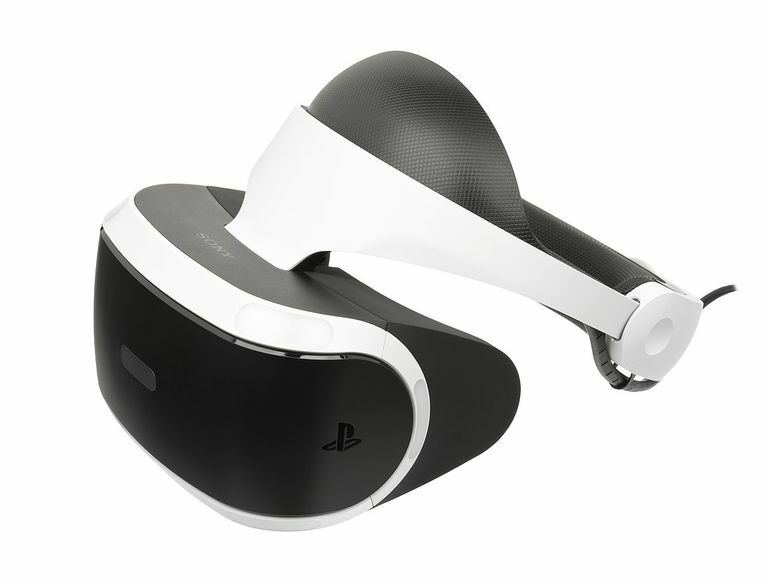 PlayStation VR combines 360-degree tracking of your head, stereoscopic images with a 120Hz refresh rate, binaural 3D audio and an expansive field of view that makes it feel as if you're in the actual game that you're playing. By simulating an alternate reality and essentially replacing your physical surroundings with the game world, PSVR captivates your mind resulting in an engrossing gameplay experience. What Does the PSVR System Consist Of? As with all virtual reality systems, the key component is the headset; which displays a different image in each eye. Within the headset are motion sensors and LED tracking lights which, when combined with the PlayStation Camera, continuously monitor the position of your head. These coordinates are utilized by applications and games to instantly render 3D images in real-time, comprising the heart of the virtual reality simulation. Connected to the headset is a pair of wired headphones that deliver 3D audio, which simulates sounds coming from your left and right, in front and behind and even above and below you. A built-in microphone allows for voice chat in multiplayer games. Also included in the more expensive bundle are two PS Move motion controllers that provide 1:1 hand tracking via the Camera and are designed to allow for intuitive interaction with the virtual world. Depending on the game setting these controllers can represent a number of items including weapons, sporting equipment or just your hands. These PS Move motion controllers are not necessary to play most PSVR games, however, as many support the traditional DualShock 4 as well. They do provide a much more realistic VR experience in some cases, though. Another accessory that can be purchased separately is the PSVR Aim Controller, a two-handed device intended to simulate a projectile weapon in first-person shooters. There is also a controller set for driving and racing games available from a third-party company, containing both a steering wheel and gas/brake pedals. What Types of Games Does PSVR Support? The PSVR game library continues to expand and includes hybrid genres that were not possible on a standard PlayStation 4 system. Titles that support the virtual reality experience are clearly branded as such and can be found in their own category on the PlayStation Store. Standard PS4 games and other 2D content including movies can be viewed with PSVR in Cinematic Mode. How Does Cinematic Mode Work? When viewing non-VR applications and games using the PSVR headset, a virtual screen containing the content appears between six and ten feet in front of you. This screen can be shown in small, medium or large sizes and lets you enjoy the PS4's standard functionality while remaining in the VR environment. Since Cinematic Mode itself is controlled by the PSVR's Processor Unit there is no noticeable impact to performance. It should be noted that all output in Cinematic Mode is 2D, meaning 3D videos and games will be downgraded accordingly on the virtual screen. A common concern with virtual reality in general revolves around its potential health risks. Taking the following precautions can help avoid these dangers. Designate ample space: Setting up your PSVR in an area that contains obstacles like furniture or pets is a big no-no. Once you're inside the virtual world you will almost always lose perspective regarding what's around you in real life, which could result in a minor injury like bumping a leg or something more serious like falling through a glass table. Not to mention what could happen if you accidentally step on your poor cat or dog. Take frequent breaks: As is the case with all gaming, eye strain and increased risk for other vision and sight-related issues comes into play if you're staring at the screen too long. This potential hazard is amplified when using a virtual reality headset. Listen to your body: Due to the overall nature of the VR experience, many gamers have reported headaches and even motion sickness accompanied by nausea. These symptoms tend to be more prevalent with certain titles and should not be ignored once they start to occur. If you don't feel good at all, stop playing. Know your limits: The great thing about the PSVR experience is how realistic it can be, especially after hours of gameplay when you're fully immersed in another world. Unfortunately some of these games seem too real at times, which can be overwhelming for younger children and others who are prone to confusion or fear. Keep this in mind before turning on that headset and preparing either yourself or someone else for a virtual reality journey.